Last week I had some leftover rice, half a bag of frozen spinach and the ingredients to make “cheezy” sauce from Veganomicon . What did I do? Made a Cheezy Spinach Rice Bake of course! Make cheeze sauce. 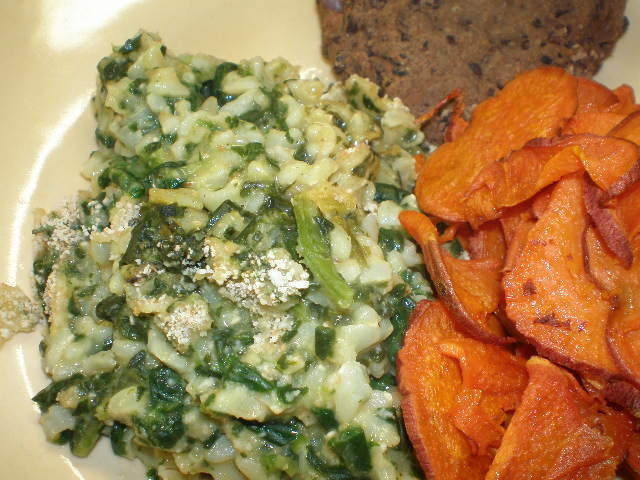 Mix rice, spinach and cheeze sauce together in a big bowl. 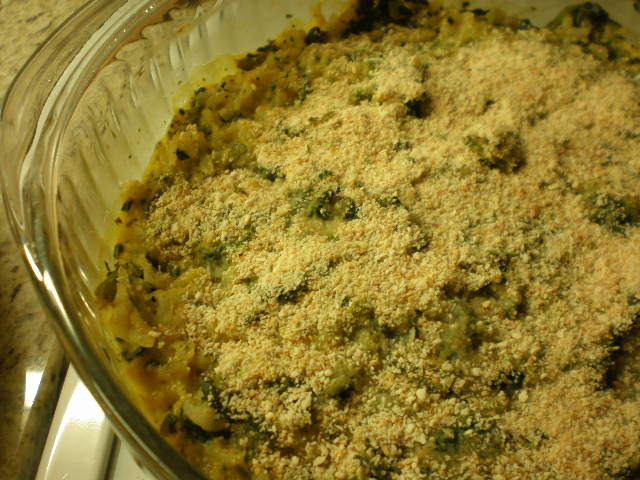 Spread in a casserole. Sprinkle with bread crumbs or crunched up crackers or something else equally crunchy and tasty. Bake at 350 degrees F for 20 minutes or so or until hot and bubbly. The bread crumbs didn’t really do what I wanted them to do (make a crunchy top), but that’s okay. Because this stuff still tasted awesome! It was a great way to use up leftover rice and sneak some greens into the meal. 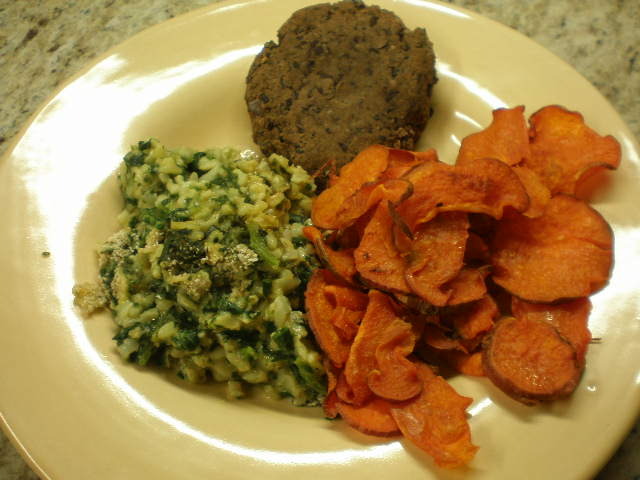 Here it is with a bunless black bean burger and Benzo’s second attempt at making sweet potato chips. The first attempt pretty much failed as the “chips” were a soggy mess. This attempt was much better, though the chips still weren’t crunchy enough. If anyone knows how to make sweet potato chips, please tell me! Or if they are impossible to make and I’m the only one who doesn’t know that, I’d appreciate a heads up. Has anyone else ever made the cheezy sauce from Veganomicon ? It is seriously so delicious. I’ve made it twice now. The first time I put it on lentil tacos and the second time was when I made this baked dish. If you want to use regular cheese, go for it! Use about 1 cup of whatever cheese or cheese blend you want. However you may want to add some spices to flavor the dish a bit more. The cheezy sauce recipe from Veganomicon already has a lot of spices and is full of flavor so I didn’t feel the need to add anything extra. But if you are feeling adventurous, think about trying the cheezy sauce. 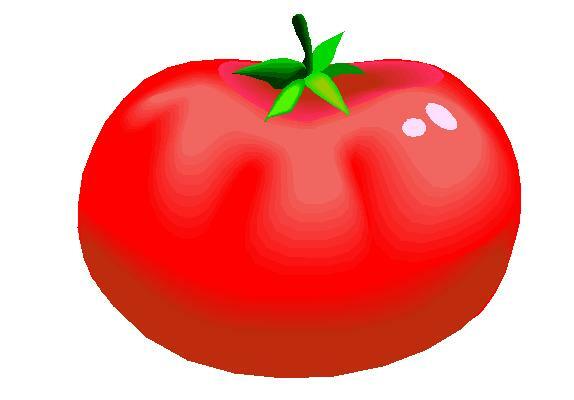 You will be surprised by how delicious it is! Previous Post I’m Sorry Seedlings! I’m interested in the sweet potato chips when you get that perfected!! Or even if they are just okay. I’ve been thinking about making those for quite sometime now. We make sweet potato fries and they are pretty good. I used Martha Stewart’s recipe as a base for the fries. Adding a dash of chili powder makes them even better!